The Hubsan X4 is a great little drone that comes in two versions- the standard Hubsan X4 (H107L) and the Hubsan X4 (H107C) which mounts a camera on its underbelly. And don’t be fooled – this drone is little, since it measures only 4.6” x 2.3”. But don’t let its small size fool you, since it has impressive power and incredible stability compared to even many of the larger drones on the market. The Hubsan X4 with camera has all of the same features at the standard model, and comes with an LED illuminated body and USB port that allows it to be charged on a computer. The only differences are that it comes with a camera and an SD slot on the drone. The camera can only record directly to the SD card though, so there is no streaming video while you’re flying. This drone is mainly designed for indoor flying, but it’s surprisingly capable of outdoor flight. Its excellent stability makes it a great starter drone for someone wanting to learn to fly outdoors, and its affordable price and ease of repair makes any crashes an annoyance, but not a disaster. 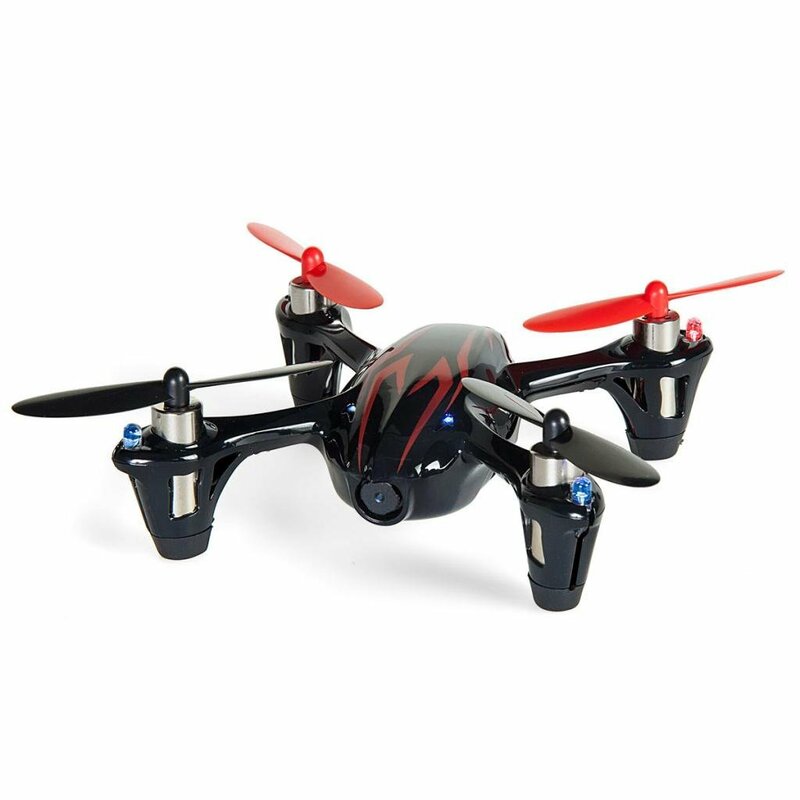 The Hubsan X4 with camera comes with a lithium polymer battery, that on a full charge can provide up to 8 minutes of flight. A more accurate number would be about 6 minutes, since the camera on this model adds a bit more weight that seems to reduce the flight time. Once the battery starts to run low, the LED lights will begin to blink so that you can bring the quadcopter down before the battery runs out. The remote control is pretty standard for quadcopters, and it is a 2.4ghz transmitter that can be toggled between normal and expert modes. The trim adjustments are done via an LCD screen on the controller and you can also perform trick flying with this controller. All of the tricks have to be done via combinations on the controller, so it does make it somewhat difficult to get used to. 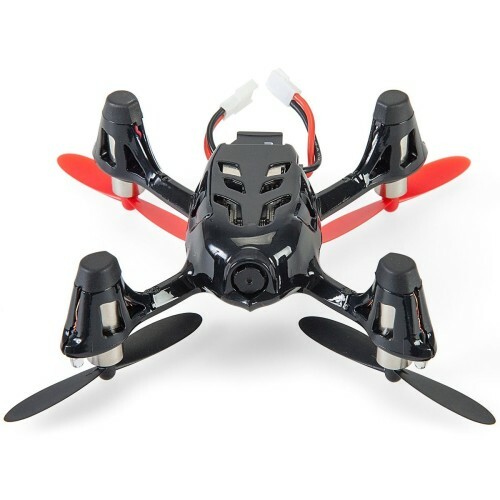 The Hubsan X4 with Camera can perform many of the same tricks as more advanced drones, and with a bit of practice, the average person can perform barrel rolls, flips and banking. It also recovers quickly from these tricks, so it is pretty forgiving when you’re first trying them. Having recently reviewed the Hubsan X4( H107C), I knew that this was a zippy and powerful little drone. So when the package arrived from Amazon, I wasted no time assembling the drone. It was far quicker than the first time, and once the drone was charged up and ready to go, I immediately headed outside to test it out. If you’re not familiar with the Hubsan drones, they have a surprising weight for their diminutive size. And like I already stated above, this is a small drone. When I first ordered the Hubsan X4, I had expected a much larger drone than what arrived. Once I was outside, I sent the drone on a basic flight to test the camera. The camera on this drone isn’t adjustable, so any footage that you shoot with the camera will have to be aimed by your flying. The excellent responsiveness of this drone did allow me to shoot 360 shots of the green space behind my house, and I was able to maneuver it in for a few interesting shots. While the quality of the film is far from HD, it is still impressive for such a budget priced drone. The shots are clear and you can take passable stills from the video if you need photos of what you’ve been shooting. The videos can easily be uploaded to your computer with the SD card, and while the video brings new meaning to word shaky cam at times, it is still usable. The drone itself is very easy to fly, and even a novice should have few problems keeping it perfectly level, or stable during flights outside in calm conditions. There is a lot of power behind this drone though, so expect damage to the drone if you crash. While it could just be my imagination, I did find the controls to be slightly more sluggish on the camera model. However, this is a minor trade-off for the ability to record with this affordable drone. It was still able to perform all of the advanced flight maneuvers, and I was quickly able to pull off banking and barrel rolls with the Hubsan X4 with camera. This is one of the best budget priced drones on the market, and the camera makes it even better. It’s a great starting point for anyone new to drones, and while the videos aren’t anywhere near HD, they do add a fun component to this operation of this drone. Click here to read more reviews at Amazon.com .